The worst part of today was being ever so gently ejected from the ward as they prepared to take Bill to theatre… It felt as though I was leaving my heart behind. Can’t sleep alone in our bed, elsewhere beds yes, where my sleepy searching hands find other,smaller boundaries and return resigned to each other…but in the bed we have shared for so long they search hopefully throughout the night, unable to comprehend the space that has opened up were you should be. Saturday morning after the frightening Friday… the rain arrives and I walk Salsa through the misty light along the edge of the woods, they smell very lovely this morning, like warm water dropped onto spices. Frothy cow parsley trembles delicately above the buttercups and speedwell and the last few forget me knots, lonely blue buttons at the end of curling bare stems. The post Solstice quietness of the birds only broken by the hoarse soft crooning of wood pigeons and the alarm calls of Blackbirds as Salsa bustles through the undergrowth. 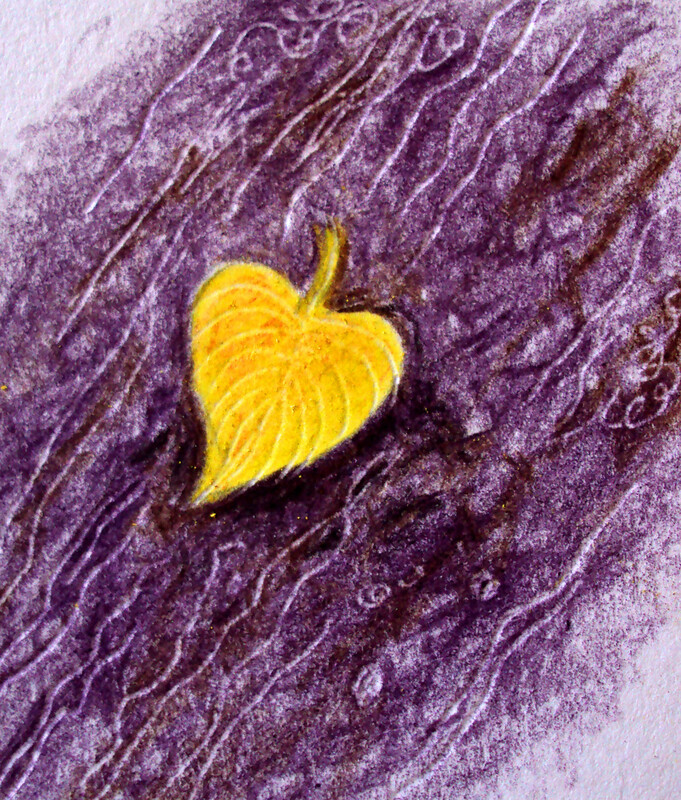 a solitary yellow leaf lies on the purple path, like a tiny golden heart. I need this green haven more each year that passes, with my own seasons starting to be more keenly understood I feel more connected with it’s slow inhalation and exhalation as the year turns and the cycle completes as always, despite delays, despite vagaries of weather and light, the primroses and wood anemones will appear. The river will run brown and furious and then clear and damselfly calm. As I waver between the frenzied activity and total inertia brought on by anxiety, the lodestone of my psyche spun this way and that by dreams and fears I hold the continuity and change of my environment behind my eyelids and picture the future knowing change is inevitable and eternal. My Dad tells me that he found me sitting on the back doorstep very still once when I was about 6 years old ‘what are you doing Katherine? He asked. ‘Oh, just being’ I replied. Pleasure in really small things… motes of dust in the sunlight on a quiet afternoon, stirring a large pan of soup, raindrops on alchemilla like tiny worlds of light. Over to see Bill later, he relieved that he still had his memory intact (I did point out that unless he was keeping it in his foot it was probably fairly safe…) me so happy the fearful anticipatory look had gone and the pain seemed to be minimal, for now at least. Arriving in Ironbridge at 12.30pm we dashed across the Bridge to find my lovely Sisters had just finished their first dance! So proud of them getting on with it without me but wish I could have arrived when they were still dancing to cheer them on! you know that running on the spot with the jazz hands thingy that 5 year olds do? Every fibre of my being wanted to do that… still does now I’m thinking about it again. Beautifully written and a delight to read! Lovely x Finding beauty and pleasure and indeed fun as we get older and face life’s adversity is what it is all about! Can only echo the first comment – beautifully written and a delight to read! Hope Bill progresses well: my husband had a triple bypass 6 years ago so I know what it’s like to leave him in the hands of strangers and wander round as if lost. And oh, the happy memories of dancing out with my clog morris side……. Beautiful writing, so glad you decided to blog! A wonderful piece Katherine.. and so like you to paint a picture in our minds of the beauty of nature. I love your portrayals of wild flowers, “frothy cow parsley, lonely blue buttons of forget me nots and boldly rising garlic”. You can see the happy coming back through the writing as you read down! Very beautifully written, and crafted. I enjoyed this.